SPN partners with CABM for CSR initiative "SPN Challenge Trophy 2018"
Mumbai : Sony Pictures Networks India (SPN) partnered with the Cricket Association for the Blind of Maharashtra (CABM) as sponsors for the SPN Challenge Trophy 2018, a state level tournament for the blind. The tournament was held between 8th – 10th October 2018 at various venues including Islam Gymkhana, Parsi Gymkhana and Police Gymkhana in Mumbai. 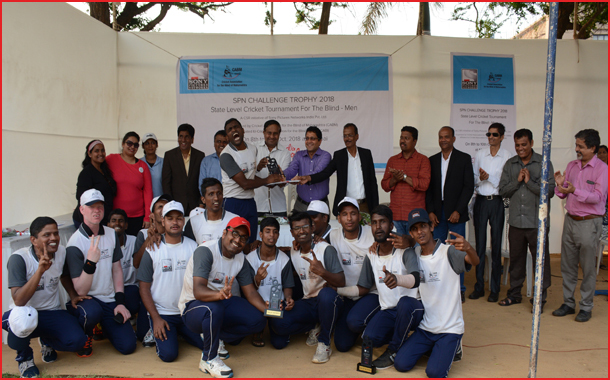 The SPN Challenge Trophy 2018 saw the participation of six teams of young blind cricketers from Mumbai, Konkan, Vidarbha, Marathwada,Khandesh, and West Maharashtra.The tournament was inaugurated on 8th October 2018 in the presence of Mr. Ajit Ramesh Tendulkar. The closing ceremony on 10th October 2018 was graced by Mr. Rajkumar Bidawatka, CSR lead – Sony Pictures Networks India Private Limited, Mr. Ganesh Iyer, committee member of Mumbai Cricket Association (MCA) &Mr. Pravin Dhopat, a renowned writer, who came to extend their support and motivate the players. The West Maharashtra team won the tournament after a tough match played against the Marathwada team. The winners were awarded a trophy, certificates and prize money of Rs 10000/- while the runners-up were awarded Rs 7000/-. All participating teams were given a consolation prize of Rs 3000/- each. Through its endeavors, Sony Pictures Networks India has always aimed at empowering India and transforming the sports narrative in the country by its on-air and off-air initiatives. This sporting tournament is one of the many steps taken by the network to support the differently-abled youth and empower them. SPN is committed to co-creating India’s social development agenda through its focus on education, empowerment and environment. The objective of SPNs social impact initiatives is to promote the spirit of ‘Ek India Happywala’.